"[Kristina Ramsey is] very bright, very determined to find the answer, and able to bring different skills to matters." 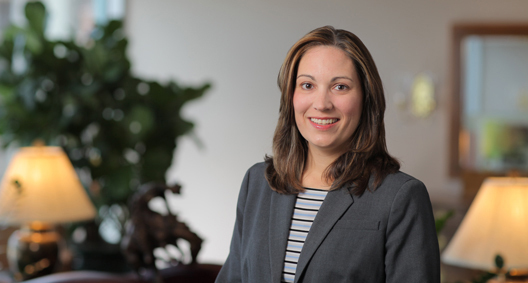 Kristina Ramsey practices predominantly in the area of environmental law, focusing on the management of environmental risks and liabilities and compliance issues. Her practice includes the investigation and remediation of contaminated properties and the representation of clients in the defense and pursuit of enforcement and cost recovery claims under CERCLA and under state environmental laws. Kristina understands the significance of focusing on details in evaluating her clients' environmental needs. She makes it a point to learn the intricacies of the often-complex industrial processes, operations and development objectives of her clients, which allows for a thorough evaluation of environmental matters and ensures productive and meaningful interaction with clients' technical consultants. Represents utilities, municipalities and current property owners in connection with the investigation and remediation of former industrial sites. Has assisted in negotiating settlements with the United States Environmental Protection Agency (EPA) and with state and local environmental regulatory bodies; represents clients identified as potentially responsible parties under Superfund and similar state programs; identifying other potentially responsible parties; negotiating cost allocation agreements; and litigating allocation and cost recovery claims under Superfund and damages claims under state law. Defended and negotiated enforcement action settlements on behalf of clients with the United States EPA and the United States Department of Housing and Urban Development regarding alleged violations of federal lead-based paint disclosure rules. As part of the preliminary evaluation of the alleged violations, oversaw the client’s lead-based paint risk inspection and risk assessment team efforts in regard to large apartment complexes. Worked with local governmental authorities to address the infrastructure on sites containing lead-based paint. Defended and negotiated an enforcement action settlement with the United States Department of Justice and the United States Department of Army Corps of Engineers concerning alleged violations of the Federal Water Pollution Control Act (Clean Water Act) and the Rivers and Harbors Act of 1899. Researched and reviewed decades of complex permitting history for the site in relation to various landowners and regulatory authorities, and ultimately assisted in negotiating a settlement on behalf of the then-current landowners for work unintentionally undertaken without appropriate authorizations. Represented clients in administrative appeals of the United States Department of Army Corps of Engineers' jurisdictional determinations and permitting decisions. Appealed a Corps jurisdictional determination that certain wetlands were subject to federal jurisdiction and regulation as "waters of the United States." Established that the Corps District was incorrect in asserting jurisdiction based on its application of the then-current regulatory criteria and associated guidance by persuasively arguing that the Corps District's administrative record was speculative and did not contain substantial evidence in support of its determination.